20 sheets of Laser and Inkjet Printable Post Cards, 4-1/4" x 5-1/2". Same size as Avery® 5315. There is a template in Word, and most labeling programs. You May be able to Save on postage by sending at Post Card Rate. 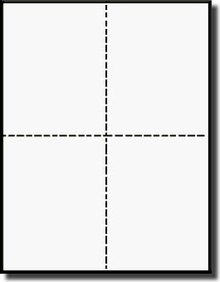 There are 4 blank cards on each 8-1/2" x11" sheet yielding a total of 80 Postcards are made of 67# White Bristol card stock.